Bloomberg News and others report that Amazon will buy Whole Foods for $13.7 billion in cash. In cash! That breaks down to Jeff Bezos and company paying $42 per share for a chain of health food and lifestyle stores. In cash! Amazon confirmed the Bloomberg report just minutes after it hit the web. 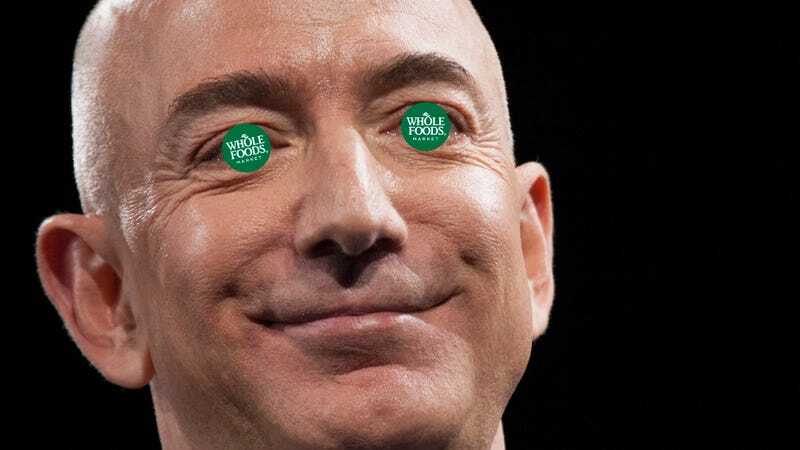 “Millions of people love Whole Foods Market because they offer the best natural and organic foods, and they make it fun to eat healthy,” said Bezos in a press release. Presumably, this deal will make it fun for Jeff to become the richest man on the planet. The deal is a doozie, too, no matter how you measure it. Amazon’s been making waves in the retail space for a few years now, most recently opening up brick and mortar bookstores as well as testing out an automated grocery store concept. There’s also Amazon Fresh, the online stores next-day grocery service that’s been steadily growing for years. The idea that the Seattle-based company would want to buy a premium brand like Whole Foods, not to mention gain access to all of its real estate and logistics, makes all of these seem like a warm up for Amazon’s massive takeover of real world stores. A doozie it may be, but this is not yet a done deal. Whole Food shareholders still have to approve the purchase, as do regulators. Amazon says both parties expect “to close the transaction during the second half of 2017.” Who knows how long after that you’ll start seeing Kindles for sale in the Whole Foods checkout and Amazon Echos on display in a new Whole Foods electronics section. God, just imagine Alexa’s power when she’ll be able to tell you the price of 28-day dry-aged beef in the Whole Foods meat department. Then again, Jeff Bezos does have a track record of purchasing companies, infusing them with new capital, and then sort of leaving them alone. That’s more or less what Bezos did after purchasing The Washington Post, aside from offering some free subscriptions to Prime Members. Time will tell, and without a doubt, Bezos will boost his net worth eventually, now that he owns a grocery store with the nickname “Whole Paycheck.” So let the jokes and the sooth-saying begin.